This is what we had last night. I made an assumption that this chilli bean recipe adapted From Anna's Kitchen was going to be a breeze to make, but I was foolish. This is one of those recipes a person ought to make in advance or when they've got time to potter around in the kitchen, as there are quite a few processes involved. One thing that was in my favour though was I did soak the black beans overnight, plus we recently purchased a pressure cooker. As I am still quite nervous with the pressure cooker hissing and spinning round and round, I permitted D to cook the black beans for me. Once that stage was completed, it was over to me. It was a good two hours before there was food on the table. To accompany the Smoky Black Bean chilli, I made some Jalapeño and corn muffins. The immediate reaction I got to this was cakes with a spicy -savoury dish. Well these are not the sweet muffins, but savoury ones. Perhaps I should have sold them as Jalapeño and corn bread. But I didn't have to, once they all tucked in, they were enjoying the dish or so I thought. The youngest did not appreciate the smoky flavour of the chipotle peppers in the chilli, but he did quietly eat it all. What a good nephew. I thought the muffins were exceptional. As you bit in the soft warm texture, the sweetcorn would burst in your mouth, then you would get a gentle kick from the chopped Jalapeño and a hint of coriander. Delicious. I will be making these again. Unlike other chilli bean recipes I've made in this past, this black bean chilli is deep and dark like chocolate. I really liked it. You don't have to serve it just with the Jalapeño and corn muffins, tortilla wraps and plain boiled rice would work well too, and that's what I'll be having with the left overs this evening. Put the dried chillies in a small pot with just enough water to cover them, and simmer for about 10 minutes, or until they are soft. Remove the chillies from the water (reserve the water), let cool for a few minutes, then pull off and discard the stems and seeds. Place the chillies and their simmering water in a blender and puree. Add the dried oregano, ground cumin and paprika to the mixture and puree. Set aside. Heat the 2 tablespoons of olive oil in a large saucepan, and add the onion and garlic. Cook until the onions are soft and translucent, then stir in the chilli puree, the chopped tomatoes and their juices, vinegar, sliced green chillies and salt to taste. Add the beans and as much of their cooking liquid as you like. Bring to a boil, then turn down and allow to simmer over low heat for at least 30-45 minutes, until it has the consistency you prefer. When ready to serve, stir in the chopped coriander leaves, taste and adjust seasoning if required. The dried Ancho and chipotle chillies I used in these muffins, were those that my nephew bought for me a few months ago from a delicatessen in Cardiff. I may need to place another order. In a bowl, sift together the flour, cornmeal, baking powder and salt. In a wide pan, add the oil and the onions and cook until translucent. Stir in the corn kernel, Jalapenos and coriander, and gently heat through and remove from the heat. Beat together the egg and milk, and stir into the dry mixture. Then fold in the oniony corn mixture into the batter thoroughly but gently. Spoon the batter into 12 muffin cups, and bake at Gas mark 6 for 20 – 25 minutes, or until they are golden on top and a toothpick inserted in the center of the muffin comes out clean. Serve hot or warm. This is one of my nephews plates where he whirled in some soured cream. MMMmmm I'm not sure, looks like a funny face to me! Your chili and muffins look delicious. So warm and comforting on a cold winter day. I love using dried chillies too! They have such a wonderful depth of flavor. Any leftovers?...he he! Very nice meal...so comforting and warm...yumm!...yumm! I so badly want to dig into that chilli! It looks awesomely good. What a find! I'm always looking for good vegetarian recipes - and your site looks to have some delicious ones. 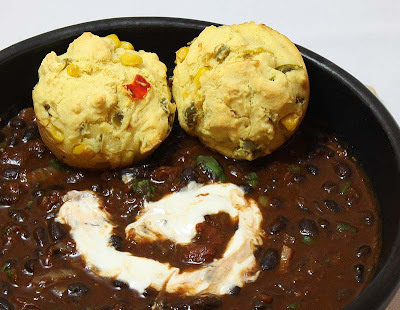 I'm gonna try the Smoky Black Bean Chilli! Oh, it looks so tasty. Like a big bowl of comfort and warmth. I love the color in those muffins too, big fan of jalapeno. Oh my goodness that chilli looks so delicious, you have me thinking of getting a very late night snack but I just had my fruit tea and I am not going to waver and indulge in late night snacking, nope, nope, nope! I can't remember the last time I made cornbread, my recipe is very similar to yours but I used sweet peppers instead, I think the jalapeños would make a nice change. I should revisit the recipe again, it been too long. those muffings sound fantastic! i had cornbread with jalapeno jelly once and it was so good. Love the look and sound of the chilli - a little bit different to my current favourite but I'll give this one a go. A great winter warmer. The muffins sound delicious, I can just imagine the flavour of the sweetcorn bursting in the mouth. It's good that the recipe makes a good portion, so that you can enjoy it a second evening after all that preparation. gosh both dishes sound divine! just what I want now! I want to go whip up those Kaluha cream pots immediately. It's the first time i've ever used these dried chillies, and its been a good experience. I will be using them again in the near future. I intend to have a go at making my own chipotle sauce soon. I am glad I wasn't the only one seeing a face in the chilli bean dish. What a lovely comment. You've made me smile! I do hope you like some of the recipes here. 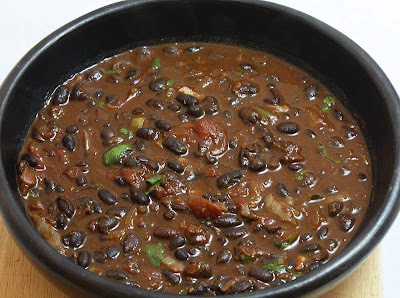 This Smoky Black Bean Chilli is just that, smoky! I hope you enjoy it. It sure is different. Thank you Jagruti. When cooked well so that they melt in your mouth. I really do adore black beans. 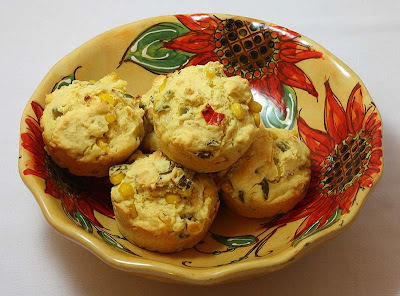 If your a big fan jalapenos, I so recommend making these muffins. You made me giggle with your temptation to snack during your healthy drink. 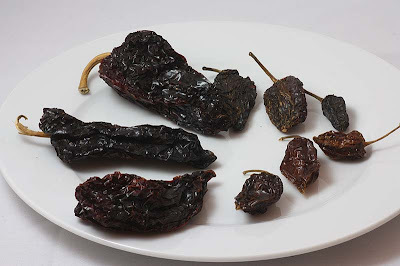 This chilli is different - not very spicy, but smoky from the chipotles. Its my first time making cornbread muffins from scratch, and I really, really enjoyed the taste of these. I'll try them with the addition of sweet peppers next time. I especially liked the jalapenos in them. Jalapeno jelly, now you got me thinking. Wow!!!! I must admit My favourite chilli bean recipe comes from Denis Cotters book. This one is adapted from Anna Thomas is very different in that it is smoky in flavour, rather than spicy which is what I normally go for, but the jalapeno muffins filled that gap. It is truly a great winter warmer. The bursting of the 'sweet' sweetcorn in the mouth is really goooooood. I totally agree this recipe does make a generous portion, Its a good recipe to make in advance for reheating. In fact it tastes better a day or two later, and the muffins don't take much time to put together. Thank you so much Maninas. I do have some chilli left over! Welcome MaddyG and Thank you so so much. I did see the Vic won the Pay it Forward which is great. I can't wait to see where it goes from there and what he gets! I want to make some of these muffins! I don't have too picky of eaters at my house, but my oldest doesn't like hot (spicy) things. I'll just have to make some for the rest of us. These are really good, hence the reason I made them again. You can omit the jalapenos for your oldest and then stir in afterwards for the rest.